"Oh yeah, I'm sure your turkeys are going to field a great team this year. Uh, sorry, I mean 'your Hokies.' But I mean, a Hokie is a turkey right? Same deal?" That's the type of conversation I typically have weekly during the football pre-season with my longtime friend Brian. He graduated from Virginia Tech in 1998, I from Clemson the same year. When Tech entered the ACC in 2003, that only cemented the rivalry. But deep down I've always harbored the notion that Virginia Polytechnic Institute is one of the nicest universities in the nation. Even in the heat of this past football season, as my Tigers prepared to face off with the Hokies, I couldn't help but give them a nod for their generosity. (Although you'll see I couldn't help make fun of their "Hokies Respect" sportsmanship campaign.) I've harbored that secret notion about Virginia Tech because the university was the backdrop of one of the most pleasant weekends of my life, and conversely, on one of the more unpleasant days, doctors at the now-famous Montgomery Regional Hospital provided some of the best medical care I've ever received. 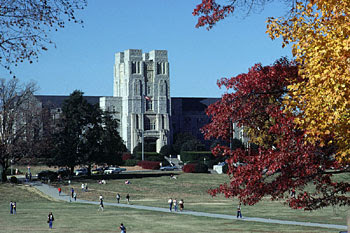 In October 2003, I traveled to Blacksburg to see the Hokies take on No. 2 Miami. I'd spent the day tailgating with Brian and other friends who are all alumni -- some of the most laid-back people you'll ever meet, on the most perfect autumn day you'll ever see. With the sun setting over Blacksburg's hills, we made our way to the stadium, stopping to take part in a then-fledgling tradition in which the Hokies walked through the cheering fans to get into the stadium. Inside, I found myself cheering and jumping up and down like a loon for the Hokies. And then they won. Color me impressed. The next day I had to swallow a bit of pride and ask if we could stop off at the campus bookstore. I wanted to get a T-shirt. To their credit, Brian and another friend (also Bryan) kept the smirking to a minimum and waited patiently while I bought my shirt. Then we spent the morning slowly meandering across the various fields and porticoes that make up the campus, the guys pointing out the landmarks of their collegiate shennanigans and academic pursuits. Again, I was surprised and impressed. As it's an engineering school, I'd expected unremarkable concrete buildings. To the contrary, the campus, especially in autumn, is beautiful. This past fall, I traveled again to Blacksburg, this time to see my Tigers take on the Hokies. But because of a peculiar chronic syndrome I've got, I ended up being taken by ambulance immediately after the game to Montgomery Regional Hospital. This illness seems to rear its head when I travel, so I've logged a lot of time in middle-of-nowhere hospitals. But this time, yet again, I was impressed. The staff at Montgomery Regional was efficient, professional, compassionate, and unlike most times when I arrive at a hospital with this illness and am greeted by skepticism or incompetence, they were helpful. The doctors and nurses there had a young woman in front of them who'd been brought in from campus, had spent the day tailgating and yet they didn't question me twice when I said that I'd only had a couple beers that day and that that wasn't the problem. And perhaps most importantly, through the whole thing, Brian and another friend, Joey, didn't complain once about having to pass up their well-deserved post-game partying downtown to hang out in the waiting room of the hospital. Today, I'll dig into my dresser and get out the Virginia Tech T-shirt I bought that morning in 2003. I'll wear it as my own tiny act of defiance against a monster, and to honor a school that I consider a class act. This is great, BB, thanks. You're a class act. Well done. Ok... so I'm back reading and a little behind. I wish we'd had more of a chance to chat on Friday. I didn't realize until after reading this that we're both Clemson alums. Small world. But fun. And also, my friend Jimmy, who I believe you met on Friday also - is a Clemson grad as well.